Great work on the omega case. Bravo. Excellent work on that Bulova. I really need to look in here (Mods & Wreckers) more often. I can tell you as an owner of a Rolex Explorer II you should get intellectual property on your jigs & kit and start refurbing Exp II fixed bezels - they are scratch magnets and it looks like your finish out Rolex'es the factory finish on the Exp ii ! The case had been polished a few times and "refinished" by hand - so the corner where quite round and welding would have been necesary to get corners fixed. The owner decided this was good enough! There's definitely a point where it can be taken too far. I think refinished cases are better if a degree of wear is still there. Otherwise it just looks like it's been replaced. I think refinished cases are better if a degree of wear is still there. That’s very difficult to achieve, and impossible with the Bulova above. There’s no half way house when there is that much damage and wear. Based on Macgyver’s comments the same probably applies to the Omega. No-one wants to refinish a vintage watch, really, but sometimes it’s the only way once it’s too far gone. Original is best, but only a few 40 or 50 year old watches get this far with their factory finish intact. I think he’s done a fantastic job and it’s great to read about McGyver’s journey perfecting the equipment and the process. Absolutely. It wasn't intended to be a criticism at all. The results that Mcgyver has achieved are nothing short of amazing and all the more impressive considering he's made the equipment to do it. Absolutely. It wasn't intended to be a criticism at all. Great work OP. Is this work at a 'family and friends' hobby level or are you taking on work on a paid basis? Hope you don't mind the question, I'm just curious. Actually it's both! I'm an engineer but working in the finance sector for many years. My father was a research engineer/toolmaker and I have been ”playing” with laths, mills etc since I was abt 8. The finance sector is not the place to be if you want to spin a piece in a lathe now and then, so I took up watchmaking as a hobby. I serviced and refinished my own watches but soon got so many requests for help from others that I had to start a small company to be able to pay tax etc ”the right way”! I tend to go all in and end up being a total nerd with my interests and find forums and especially DIY-sections to be great inspiration and great resources of knowledge. I used to build HiFi-equipment and electrostatic speakers and as an example, forum tips lead to tests using a spark transformer from a oilburner, salvaged at the local scrapyard, as a low frequency transformer for a speaker project – It works great, cost nothing and many years later is still in use – thanks DIY! That sounds ideal. Still at a nice scale without the pressure of doing it full time. Thank you for the pictures and the explanation of your work and machines. Amazing but humble show of your skills and ingenuity. You don't show before/after pictures of all the watches, but the Bulova is impressive. I find myself going up and down your post comparing the old vs. new. If it is the same dial, the refinished case makes it look so much better... eye catching! If it is not, you've still added new life to an otherwise very tired and boring piece. 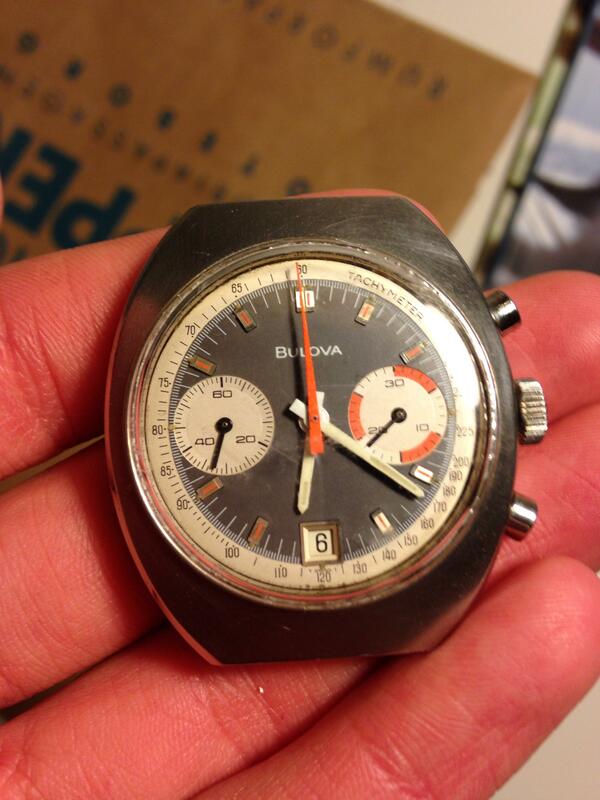 I know a lot of collectors with a drawer full of pieces such as the Bulova. They just don't get worn. Maybe they would be if they looked like the Bulova or that Seiko! This evenings work - an old Heuer case! I think this is very impressive, would it be right to assume that you could "recut" chamfers on vintage Rolexes? I need some more practice on cases with crown guards and perhaps a new jig to get the width of the chamfer perfect! What a talent. Well done. If i'm not rude, have you made also the worm drive ? Got a nice Tissot Navigator on my bench that had been badly polished and the owner wanted it restored to its former glory. As the case had been badly abused som corners etc are not perfect as I would have to remove to much material and my welder is still in its prototype state - I will have to do as it is! Last edited by McGyver; 15th June 2016 at 08:38. Nice job! I'm really curios about your "prototype welder". I have been lapping some Speedmaster MkII cases for friends and when a watch from "my" year, 1970, was for sale localy I could not resist any more! The case had seen quite a bit of lapping by hand and the surfaces whera all but flat. Not perfect but good enough until I can get my welder working!